Farmers Feed the World-Will You Stand with Them? Home | Newsletter 162: Farmers Feed the World-Will You Stand with Them? Tell President Obama to Support Small-Scale Farmers! 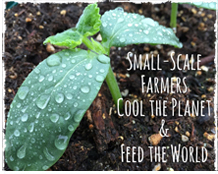 The global consensus is growing: small-scale farmers can feed the world and cool the planet! During last year’s United Nations talks on climate change, the French government made history with a proposal putting forward regenerative farming as a key solution to climate change. This initiative was dubbed the 4 per 1000 initiative for its central goal of increasing carbon stock in the soil at a rate of .04% annually—a goal that would halt the increase in atmospheric CO2 and limit temperature increases. The United States government has an opportunity to take a stand for small-scale farmers and pastoralists while taking a scientifically based action to combat climate change by pledging support for this initiative. Let President Obama know that you believe regenerative agriculture can be part of the climate change solution! Whether you’re tending to your daily routine or indulging in a little self-care, your body care products can make a difference. This summer we traveled to Togo and Ghana to see for ourselves the difference that two committed fair trade companies are making in the communities where they source ingredients. It’s no secret that we advocate for fair trade and producers empowering themselves, but what we saw when we visited Alaffia and Dr. Bronner’s supply chains exceeded our expectations. Time to Get Loud & Stop the TPP! Last week’s political conventions brought new attention to the movement to stop the Trans-Pacific Partnership (TPP). We’re not alone in organizing to prevent the passage of this sweeping trade bill that would have consequences for our daily lives–and the livelihoods of millions around the world. Now the movement has an even bigger, louder platform: Rock Against the TPP, a concert tour to raise awareness around the country and make it clear that we want a trade system that benefits all people, not a handful of global elite. We’re proud to endorse the tour, and our own Dana Geffner will be speaking at the upcoming concert in Portland on August 20th. Come on out and bring a friend! Taking Fair Trade on the Road? Join Us!